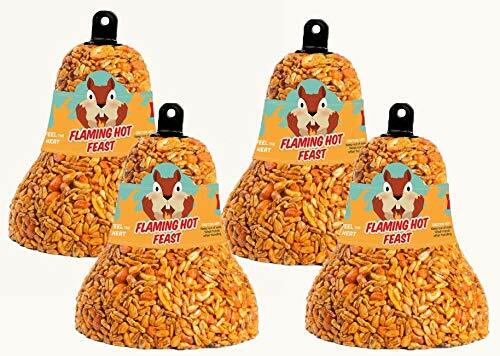 Mr. Bird 4-Pack Flaming Hot Feast Wild Bird Seed Bell 8 oz. Feed the birds with Flaming Hot Feast-squirrels not invited! 4 Pack of 4 oz. Flaming Bird Seed Bells! Discover spicy hot snacks for bird feeding without squirrels! After the first taste, most squirrels search for food elsewhere because they can't stand the fiery-hot sensation, which won't bother your birds. Contains whole sunflower hearts, shelled peanuts, golden safflower seed, mealworms and capsaicin. Perfect for year-round feeding! This product contains a strong eye, nose and skin irritant. Wash hands thoroughly with soap and water after handling and keep out of reach of children. If you have any questions about this product by Mr. Bird, contact us by completing and submitting the form below. If you are looking for a specif part number, please include it with your message. 6-Pack of Mr. Bird Flaming Hot Feast Small Cylinder 19 oz.